Well, it’s been a while since I last updated this project. Lots have been due to general lethargy, real life and other pressures. 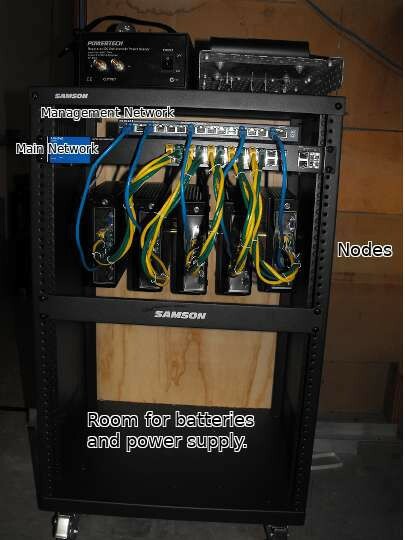 This equipment is being built amongst other things to host my websites, mail server, and as a learning tool for managing clustered computing resources. As such, yes, I’ll be putting it down as a work expense… and it was pointed out to me that it needed to be in operation before I could start claiming it on tax. So, with 30th June looming up soon, it was time I pulled my finger out and got it going. Umm, yeah… good point. Our current little server represents a small portion of our base-load power… refrigeration being the other major component. I ordered the rack and batteries a few months back, and both have been sitting here, still in the boxes they were shipped in, waiting for me to get to and put them together. My father got fed up of waiting and attacked the rack, putting it together one evening… and last night, we worked together on putting a back on the rack using 12mm plywood. We also fitted the two switches, mounting the smaller one to the lid of the main switch using multiple layers of double-sided tape. I wasn’t sure at first where the DIN rail would mount. I had intended to screw it to a piece of 2×4″ or similar, and screw that to the back plane. We couldn’t screw the DIN rail directly to the back plane because the nodes need to be introduced to the DIN rail at an angle, then brought level to attach them. The side panels actually covered over those holes: this was solved with a metal nibbling tool, cutting a slot where the hole is positioned. The DIN rail, when just mounted at each end, lacked the stability. 45mm + 3mm is 48mm… or 4× plywood pieces. We had plenty of off-cut from the back panel. Using 4 pieces of the plywood glued together and clamped overnight, I made a mounting to which I could mount the DIN rail for the nodes to sit on. This afternoon, I drilled the pilot holes and fitted the screws for mounting that block, and screwed the DIN rail to it. At the far ends, I made spacers from 3mm aluminium metal strap. The result is not perfect, but is much better than what we had before. On the power front… my earlier experiments had ascertained the suitability of the Xantrex charger that we had spare. The charger is a smart charger, and so does various equalisation and balancing cycles, thus gets mightily confused if you suddenly disconnect the battery from it by way of a MOSFET. A different solution presented itself though. My father has a solar set-up in the back of his car… there’s a 12V 120W panel on the roof, and that provides power to a battery system which powers an amateur radio station and serves as an auxiliary battery. There’s a diode arrangement that allows charging from the vehicle battery system. 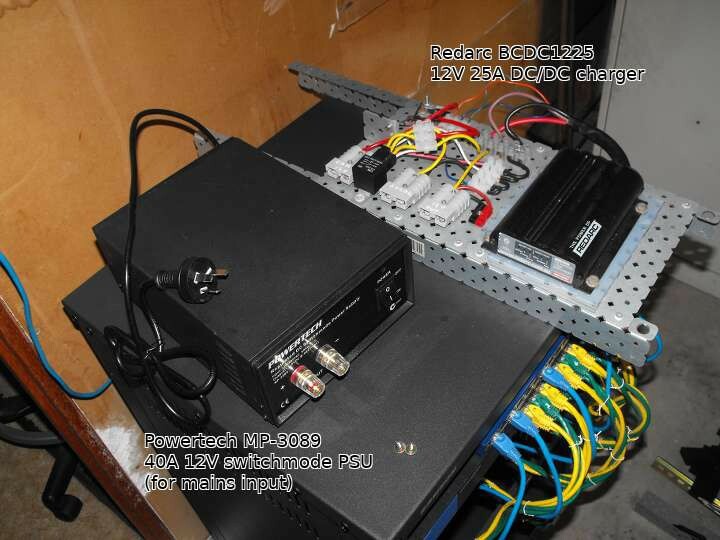 In an effort to try and upgrade it, he bought a Redarc BCDC1225 in-vehicle MPPT charger. This charger can accept power from either the 12V mains supply in a vehicle, or from a “12V” solar panel. The key here, is it relies on a changeover relay to switch between the two, and this is where it wasn’t quite suitable for my father’s needs: it assumed that if the vehicle ignition was on, you wanted to charge from the vehicle, not from solar. He wanted it to switch to whichever source was more plentiful, and had thought the unit would drive the relay itself. Having read the manual, we now know the signal they tell you to connect to the relay coil is there to tell the charger which source it is plugged into, not for it to drive the relay. use a 240V→12V AC-DC switch-mode power supply to provide the “vehicle mains” DC input to the charger. use the output to drive a P-channel MOSFET attached to the “vehicle mains”, which drives the relay.